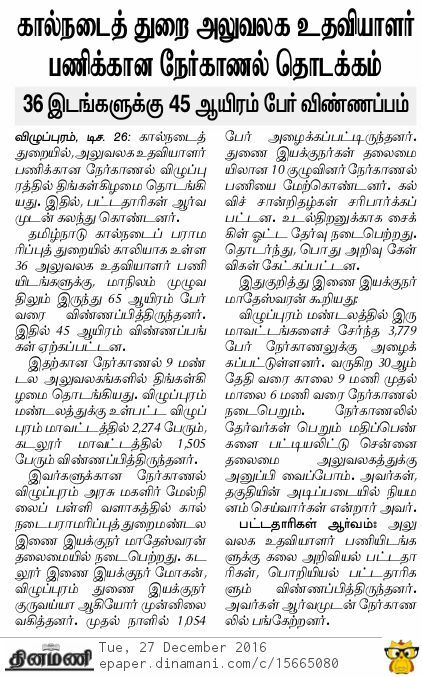 DAHVS has been published 3rd corrigendum on 15th September 2015 in Dinathanthi News Paper, we have given hereunder, the synapsis of Revised Notification. 5. Electrician - 3 Posts (UR 1 ; MBC 1 ; SCA 1) - Basic Pay 5200 Grade Pay 2400 in Pay Band I . Job seekers are requested to ask your doubts, queries in "Comment Box"
If you found any false-URL-links in this website, please feel free to contact us in tngovernmentjobs@gmail.com. 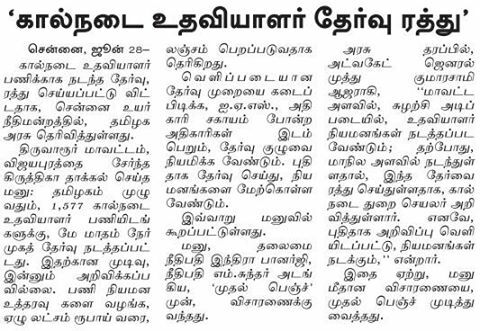 08.05.2017 : Dinamani News : Personal interview will be held for Veterinary Assistant Post (Villupuram District Candidates) on 10th May 2017. Interview Call Letter already been sent to the concern candidates address. Villupuram District : Government Girls Higher Secondary School, Thiru Vi Ka Street, Villupuram. 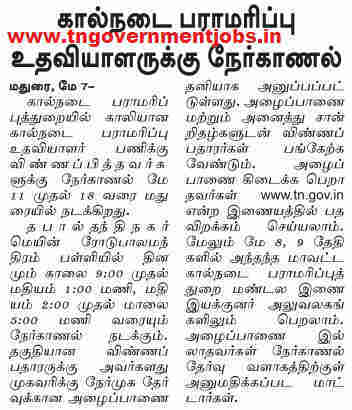 08.05.2017 : Dinamalar News : Personal interview will be held for Veterinary Assistant Post (Villupuram District Candidates) on 11th May 2017. Interview Call Letter already been sent to the concern candidates address. Madurai District : Balamandiram Higher Secondary Schoo, P&T Nagar Main Road, Madurai. Dindigul : Govt Higher Secondary School, Palani Road. Erode : Govt Girls Higher Secondary School, Erode. Tiruppur : Nanjappa School, Tiruppur. மாட்டின் பல்லை எண்ணிப் பார்த்து அதன் வயது முதலியவற்றை கண்டு அறிதல். Dear candidates, instead of buying study materials from market, Read 10th Std Science, Maths, Social Science Books. Additionally you can read 6 to 9 std school books (samcheer kalvi). Sir, Veterinary Assistant post examination fee Rs.100/- is must or nil? Please conform the details. 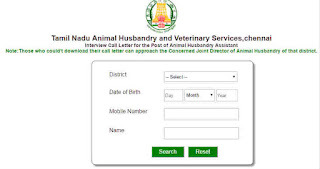 Mam livestock inspector exam question paper pattern..tamil or English..??? 12th Std is eligible qualification, so you can apply. madam pondicherry apply pannalama ? 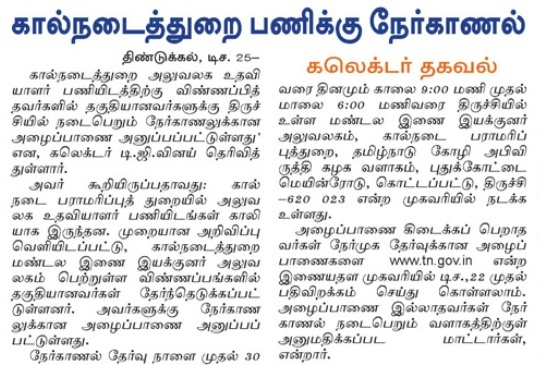 pondicherry residency apply pannalama ? pls tell me madam ? mam i have applied for live stock inspector grade 2 but i took dd in private bank.. s this ok r i need to apply again mam? Application send panumbothu hall ticket fill pani, hall ticket la photo attach pani send pananuma? Me too the same doubt... Maybe by post as we have sent the hall ticket already. 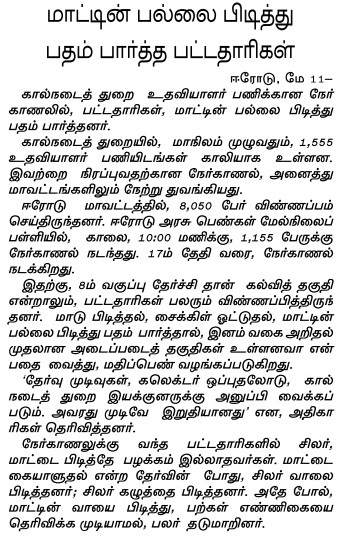 thanks for ur kind help madam.. U r giving details better than tn.gov.in . to be frank the board is inconvenience and inconsistent so far. If u know the details pls let us know mam. DAHVS, will send the hall ticket for written examination (MCQ). If any one not enclosed the hall ticket page, no need to worry about it. They will also get the same. In the mean time (don't bother about the date of exam), you have to put your concentration in your exam preparation. All the best. veterinary exam stopped any legal case,for full details give blow. 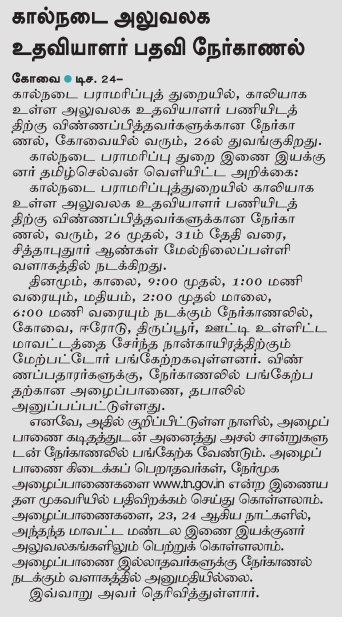 livestock inspector exam unda kedaiyatha fees kattiyachu but today dhinathanthi news paarunga. employment seniority potrukaanga yenna nadakuthu inga please verify anyone. 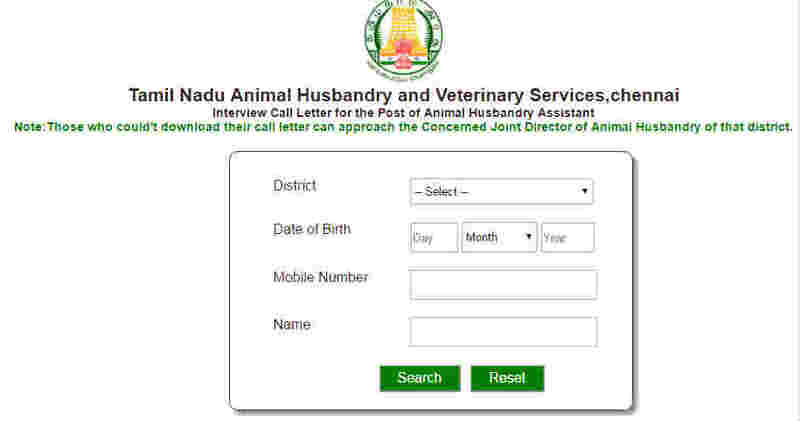 livestock inspector posting ku chennai la yepa selection?